Music education in the western world often emphasizes musical literacy, the ability to read musical notation fluently. But this is not always an easy task – even for professional musicians. Which raises the question: Is there such a thing as musical dyslexia? Dyslexia is a learning disability that occurs when the brain is unable to process written words, even when the person has had proper training in reading. Researchers debate the underlying causes and treatments, but the predominant theory is that people with dyslexia have a problem with phonological processing – the ability to see a symbol (a letter or a phoneme) and relate it to speech sounds. Dyslexia is difficult to diagnose, but it is thought to occur in up to 10% of the population. In 2000, Neil Gordon, a retired pediatric neurologist, proposed the idea of musical dyslexia (dysmusia), based on growing evidence that the areas of the brain involved in reading music and text differed. The idea that dyslexia could affect the reading of non-language symbols is not new. For instance, dyscalculia is the difficulty reading and understanding mathematical symbols. Recent research supports dyslexia and dyscalculia as separate conditions with unique causes (dyscalculia is thought to be caused by a deficit in spatial processing in the parietal lobe). If the brain processes words and mathematical symbols differently, why not musical symbols too? Reading music is a whole brain activity. Western music, like language, has a highly evolved coding system. This allows it to be written down and transmitted from composer to performer. But music, unlike language, uses a spatial arrangement for pitch. The page is divided into staffs of five lines each. Basically, the higher a symbol is placed on the staff, the higher the pitch. Unlike letters in text, pitches can be stacked, indicating simultaneous performance (chords). Music also uses a system of symbols to indicate how pitches should be played. Symbols can indicate duration (rhythm), volume (dynamics) and other performance cues. Music also utilizes written words to indicate both the expressive features of the music and the lyrics in vocal music. Lyrics may be in languages not spoken by the performer. Due to differences in the physical features of the written systems, it makes sense that the brain would read music and text differently. This appears to be the case – at least to some extent. Reading music and reading text use different systems in the brain. 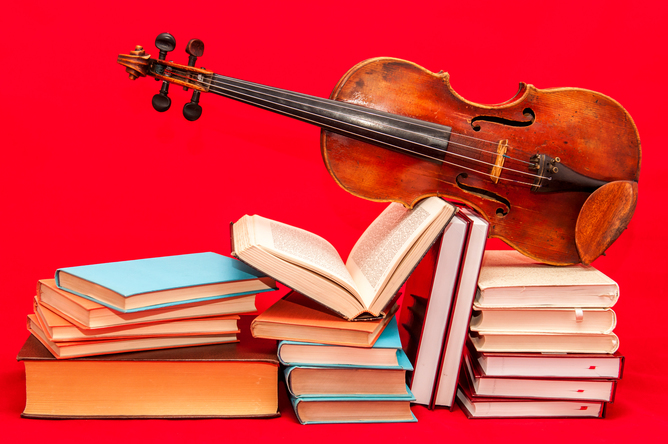 Violin and books via www.shutterstock.com. In the brain, reading music is a widespread, multi-modal activity, meaning that many different areas of the brain are involved at the same time. It includes motor, visual, auditory, audiovisual, somatosensory, parietal and frontal areas in both hemispheres and the cerebellum – making music reading truly a whole brain activity. With training, the neural network strengthens. Even reading a single pitch activates this widespread network in musicians. While text and music reading share some networks, they are largely independent. The pattern of activation for reading musical symbols and letters is different across the brain. 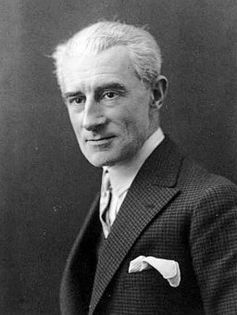 Brain damage, especially if it is widespread, as was the case with the composer Maurice Ravel, (perhaps best known for Boléro), will likely impair both text and music reading abilities. Ravel had a form of frontotemporal lobe dementia. However, there have been cases where a more limited brain injury impaired reading of one coding system and spared the other. Ian McDonald, a neurologist and amateur pianist, documented the loss and recovery of his own ability to read music after a stroke, though his ability to read text was unaffected. Oliver Sacks described the case of a professional pianist who, through a degenerative brain disease (Posterior Cortical Atrophy), first lost her ability to read music while retaining her text reading for many years. In another case, showing the opposite pattern, a musician lost his ability to read text, but retained his ability to read music. Cases where music and language seem to be differently affected by brain damage have fascinated researchers for centuries. The earliest reported case of someone who was unable to speak, but retained his ability to sing, was in the 1745 article, On a Mute who Can Sing. More recently, the Russian composer, Vissarion Shebalin, lost his language abilities after a severe stroke, but retained his ability to compose. Maintaining the ability to sing in the absence of language has led to the creation of a therapeutic treatment called Melodic Intonation Therapy that essentially replaces speech with song. This allows the patient to communicate verbally. These cases and many others demonstrate that music and language are to some extent separate neurological processes. 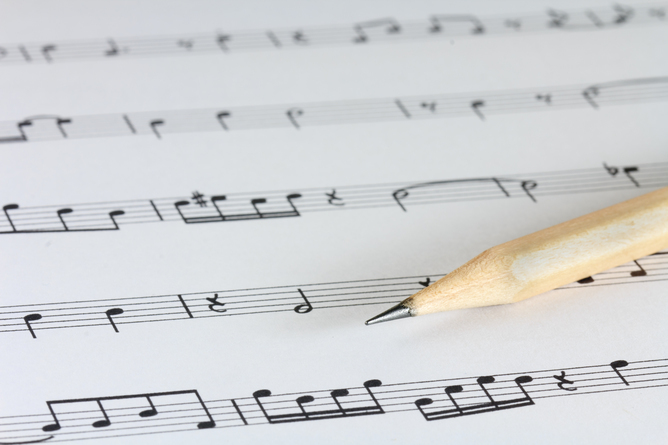 Differences in reading ability can occur even within musical notation. Cases have been reported where musicians have lost their ability to read pitch, but retained their ability to read rhythm, and vice versa. fMRI studies have confirmed that the brain processes pitch (spatial information) and rhythm (symbol recognition) differently. The research starts to imply how a specifically musical dyslexia could occur. This deficit may be centered on pitch or musical symbols or both. No conclusive case of musical dyslexia has yet been reported (though Hébert and colleagues have come close) and efforts to determine the effects of dyslexia on reading musical notation have been inconclusive. Children in western cultures are taught to read text, but not always taught to read music. Even when they are, inabilities to read music are not generally treated as a serious concern. 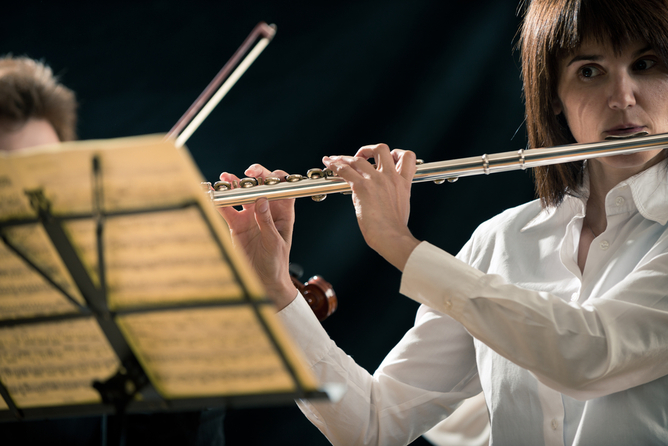 Many gifted musicians are able to function at a professional level purely learning music by ear. Among musicians, there is a wide range of music reading proficiencies. This is especially apparent with sight reading (the first performance of a notated piece). Identifying musical dyslexia could help explain why some musicians read well and others don’t.